I am a mixed, late blooming, boomer Breast Cancer “Super” Survivor chick living with a neuropathy and Lymphedema who loves to write books I would love to read and scripts that I would watch. They are honest, concerned with real lives, human hearts, spiritual transformation, memories, families, secrets, wonder, and craziness—most of all that makes me laugh. Falling into the depths of a destructive complicated father daughter relationship, identity and insuperable chauvinism issues, racism, autoimmune neuropathy, uterine and breast cancer with the unintended consequences of Post Traumatic Stress Disorder that has gone untreated are some of the critical life issues that were faced. I want to awaken and help survivors and the world to live a creative and productive life that matters through Jazz (music); Zen and improvisation through literary and multimedia arts (JazZen). In 2014, after completing an Artist Trust EDGE professional writer’s program’s recommendation, I created a personal blog entitled, Fifty Shades of Jazz, my nickname is Jazzybeatchick. I wanted to see if I had the chops to be an author, blogger, to talk about living my Samsara of Breast Cancer, parents’ deaths, Lymphedema, and a deteriorating neuropathy, on a fixed income in “a hella- less than” ideal space to live feeling as though my life was slowly slipping away. The blog became my test, a way my father taught his music students to learn and study and practice on a daily basis. My world exploded and the transformation of writing and collage art life has been reached. I am pleased to announce and introduce you to blog. The blog will begin with Super Survivor issues, i.e., psychosocial effects, Health care access, resources, cuisine, meditations, jazz plus genres, literary arts, commentary that I will build into a lifestyle website for those inclined to live sideways. I will begin with the liner notes companion since it would be a 50 year celebration of a place that healed my life. I am the native daughter of Jazz My first language was Jazz. Jazz functioned as a communal bond, ritual and form of social interaction. It has become more than just sounds. It has become a way of living in this world. Jazz has never been about music, it is the touchstone of modern cultural imagination, archiving mythical images and an aesthetic paradigm for new modes of writing, seeing, hearing and moving. I like to use the improvisational elements of jazz that I have experienced to develop different creative literary tapestry that uses all sensory input. Breast Cancer first dropped into my life in 1997 when my mother’s returned after 13 years in remission. Three years later in 2000 I was diagnosed. My first major illness was Guillain Barré Syndrome (“GBS”) an autoimmune neuropathy similar to MS. Just 4 months after my release I had emergency surgery for what I now know was uterine cancer, but in 1991, little research had been done with respect to female cancers. Now living with Lymphedema and the deteriorating neuropathy the hardest challenge of my life as a non white female, cut down in career prime, living on a limited income dealing with the psychosocial effects of Breast Cancer and finding a way to Renew, Reboot and to do an Encore filled to the gills living a Happy and Healthy and Meaningful Life. iSurvivor| The Zen of a Self Made Life is my new blog where my memories are cast on a literary substrate that creates a portal to finding meaning in my life using mindfulness jazz improvisational techniques that I learned from my father. The focus of this blog will be on the integration of the mind-body-spirit and dealing with cancer, an autoimmune neuropathy, lymphedema and the other copious unintended consequences of breast cancer, i.e., malnutrition and weight loss. My instruments are words, mixed media arts. I have to play the utterances that manifest when I am listening to sounds being translated into words in the space between the beats. Over the years, life after cancer treatment has been frightening and there isn’t any mind-body-healing programs available to deal with things other than a little depression and making sure I eat right and get plenty of exercise. Things like post traumatic stress and reversal of fortune and no apparent means of getting your life back on track. The exigency for my survival was through neuroplasticity, i.e., mindfulness, improvisation techniques taught to jazz musicians, and that this new style of Living Sideways POV can become a portal to live your best life, ever! It is my dream to create a special and unique “Blank Beat Sacred Place” that is especially designed for survivors from underserved areas a sponsored weekend for them and a guest on the Northern California Coast that would have workshops, Jazz, poetry, improvisation, focus groups, delicious cuisine and classes, mindfulness, meditation walks and exercises, yoga, Dharma & Healing Arts projects where exploring and discovering ways to use all of your senses to Rest, Rejuvenate, Restore so that you can live the life that is waiting for you. My first nonfiction book, Freedom Beats from the Monterey Jazz Festival Orchestra 65 of my Breast Cancer journey on a Jazz Lit Canvas: Liner Notes is set in Los Angeles and Monterey, California during the 1960’s Jazz scene. This is a coming-of-age improvised companion that is an acoustic literary riff shot meditation using poetry, prose, essays and art for each song featured on the CD. 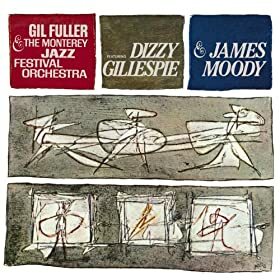 [Dizzy Gillespie and James Moody with Gil Fuller and the Monterey Jazz Festival Orchestra (2007 Digital Remaster)] It captures the struggles, loss and betrayal of a mixed race girl growing up with a renowned jazz conductor/arranger-father who took her to the rehearsals and the other major events surrounding the Monterey Jazz Festival Orchestra 1965 in Los Angeles. It was on the first night of the onstage Live performance when she fell in love with the sound of jazz and words, discovering herself, her gift and most of all her love for writing and mixed media art that saved, transformed and continues to heal her living with breast cancer at 62 years of age. I would love to remain connected! Please visit my blog and subscribe!